His first book 'Jungle', based on this incredible adventure, quickly became an international bestseller and subject of a Discovery Channel feature length documentary called 'Escape from the Amazon'. An incredible story, production is currently underway turning his lifestory into a feature film. 'Jungle' the movie is set to be Greg McLean's next thriller and will star Daniel Radcliffe - the infamous 'Harry Potter'. Yossi now speaks globally on the Power to Survive through unrelenting crisis and change, then how to harness vision to begin thriving in the new reality. His keynote presentations are suited for organisations looking to inspire and motivate people toward their goals, despite adversity or unfavourable circumstances. Time and again Yossi's presentations leave people on the edge of their seats, as if they have just lived through the experience together. 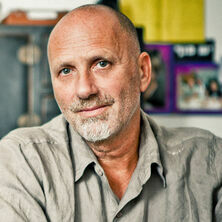 Yossi Ghinsberg is a rare voice of our generation who's compelling presentations rekindle the human spirit and energise teams to become day-to-day heros. After a tragic separation from his friends, one man is lost alone for weeks in the heart of the Amazon with no food or weapons, in the midst of the worst rainy season in decades.Through this inspiring experience Yossi Ghinsberg takes his audiences on an emotional experience of inner strength and self-discovery. You can hear a pin-drop in the room when Yoss‍‍‍i takes the stage. But there is much more than sheer entrancement in his storytelling. Yossi translates his own lessons of survival into principal and effective strategies for business excellence. In many industries, the rapid rate of change employees are facing can leave people feeling as though they are lost in the wilderness. Something Yossi Ghinsberg has experienced first hand. Yossi translates his own lessons of survival – where every single moment left him at the mercy of the jungle, and hi‍‍‍s ability to adapt fast to the changing circumstances literally meant the difference between life and death – into effective strategies for those experiencing change in the work environment. A key insight from Yossi’s harrowing story is that the law of the Jungle itself relies on collaboration. Working intelligently with his changing conditions, Yossi was able to perceive innovative ideas vital to his survival. Yossi challenges organisations to think about how they can apply co‍‍‍llaborative thinking; expanding out from the limiting mindset of pure competition, designing environments where teamwork can thrive, skills are utilised and ideas are shared.